Post-translational modifications (PTMs) are highly dynamic and often reversible processes where a protein’s functional properties are altered by addition of a chemical group or another protein to its amino acid residues. As a major cytoskeletal protein with roles in cell development, growth, motility, and intracellular trafficking, tubulin and microtubules (MTs) are a major substrate for PTMs. Tubulin PTMs usually occur post-polymerization and preferentially on the a/b tubulin heterodimers of stable (vs dynamic) MTs1-3. Here, we review the current understanding of tubulin PTMs that include tyrosination/detyrosination, Δ2-tubulin formation, acetylation, phosphorylation, ubiquitination, glutamylation, and glycylation. For each PTM, we provide a brief background on the modification and discuss the modifying enzymes (if known) and the potential function(s) of the PTM (see Table 1). Tyrosination of brain tubulin was one of the earliest reported tubulin PTMs, first described in 19744. Tyrosination and detyrosination are reversible PTMs (see Fig. 1) occurring on most alpha-tubulin subunits, but not on beta-tubulin. MTs, but not tubulin heterodimers, undergo detyrosination where the gene-encoded C-termini amino acid tyrosine is proteolytically removed. Detyrosination is associated with MT stability as long-lived MTs in many different types of cells lack tyrosination. However, detyrosination itself does not confer stability to the MTs5. Interestingly, exogenous stabilization of MTs with taxol increases the level of detyrosination1. Once detyrosinated, tubulin can be further converted into Δ2-tubulin by the irreversible removal of the penultimate glutamate residue on alpha-tubulin (see Fig. 1). Δ2-tubulin cannot be re-tyrosinated. Δ2-tubulin is also a characteristic of stable MTs such as those found in neurons, centrosomes, and primary cilia6. Δ2-tubulin is particularly abundant in brain (representing 35% of total tubulin), especially in differentiated neurons6. In MTs that have only been detyrosinated, the alpha-tubulin C-termini are re-tyrosinated, but only once the MTs have depolymerized into tubulin heterodimers7. MTs in neuronal axons are prime examples of a mixed population of detyrosinated and tyrosinated MTs. MTs in the outgrowing neuronal axon are composed of a labile and dynamic domain at the plus (distal) end that is enriched in tyrosinated tubulin and nearly devoid of detyrosinated tubulin. Conversely, at the proximal end of the axon, there is a stable domain enriched in detyrosinated tubulin that is nearly devoid of tyrosinated tubulin. These observations led to the hypothesis that MT dynamics differ throughout the axon and growth cone of neurons1-3,7. The first enzyme to be identified as a tubulin modifying enzyme is the one responsible for tyrosination of tubulin: tubulin tyrosine ligase (TTL). TTL tyrosinates alpha-tubulin, a component of the alpha/beta heterodimer and re-tyrosinates the alpha-tubulin of depolymerized MTs. The enzyme responsible for removing the tyrosine has not been identified, though one candidate was a cytosolic carboxypeptidase, CCP1/Nna18,9. Kalinina et al.8 found that a mutation in the CCP1 gene in mice decreases the level of detyrosinated MTs. Additionally, the Purkinje cell degeneration (pcd) mice that carry a mutation in the CCP1 gene have increased levels of tyrosinated alpha-tubulin, suggesting that this enzyme mediates detyrosination1. However, Rogowski et al.10 reported that CCP1 is not involved in detyrosination directly; instead, the authors10 report that CCP1 removes the penultimate glutamate residue from detyrosinated alpha-tubulin, creating Δ2-tubulin. In addition, CCP4 and 6 (but not CCP5) can also deglutamylate detyrosinated tubulin to form Δ2-tubulin10. Thus, the tubulin carboxypeptidase(s) that generate detyrosinated MTs remains unidentified (see Table 1). Figure Legend: Left image is tyrosinated tubulin (yellow residue). Middle image is detyrosinated tubulin. 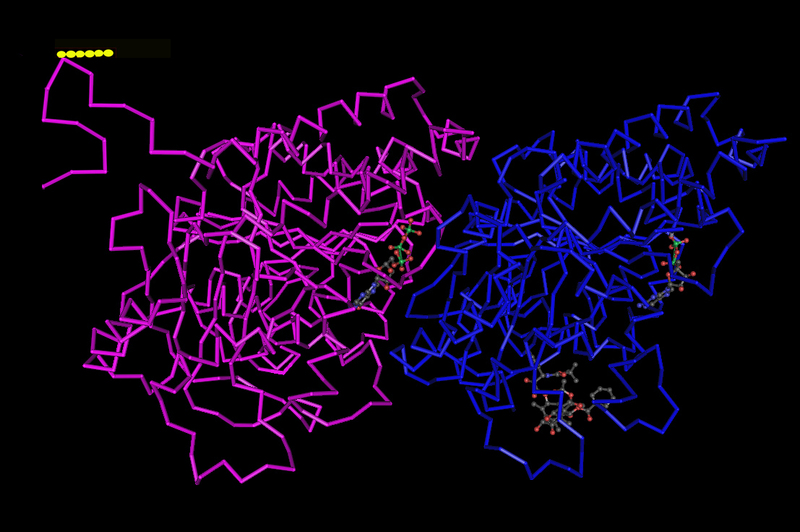 Right image is Δ2-tubulin. The tyrosination/detyrosination PTMs are believed to be associated with at least two MT-associated processes which may be inter-related. One is stabilization of MTs and the second is mediating the interaction of MTs with microtubule-associated proteins (MAPs). In vitro studies with purified tubulin detect no effects of detyrosination on polymerization dynamics11-13. Detyrosinated tubulin is found in long-lived (stable) MTs, while dynamic MTs contain tyrosinated tubulin. However, detyrosination is not the cause of MT stability, but rather a consequence of stabilization. Although detyrosination itself does not confer stability to the MTs5, detyrosinated MTs are less sensitive to depolymerization mediated by kinesin motor proteins, such as the mitotic centromere-associated kinesin (MCAK) and the neuronal kinesin family member 2A (KIF2A) which preferentially depolymerize tyrosinated MTs14. These results suggest that detyrosination and Δ2-tubulin might help protect MTs from depolymerization and thus enable the formation and function of long-lived MTs14. Conversely, the motor protein KIF5 (conventional kinesin or kinesin-1) binds preferentially to detyrosinated MTs in vitro and in vivo,15,16. KIF5’s preference for detyrosinated MTs suggests that detyrosinated MTs could be preferred cellular highways for transporting different molecular cargo (e.g., vimentin) or enable KIF5 to serve a specific transport role. Also, plus-end tracking proteins (+TIPs) help control cell architecture and the distribution of forces on MTs through a regulation of MT dynamic interactions. +TIPs proteins bind and localize to the plus ends of MTs, which are highly tyrosinated3. In this way, tyrosination guides +TIPs localization and influences their function. Examples of such +TIPs are those that contain a CAP-Gly domain (e.g., CLIP-170, CLIP-115, and p150Glued/dynactin)17,18. Not all MAP binding is affected by the tyrosination status (e.g., MAP2 and MAP4)19,20. MTs are a primary component of neurons and the interactions between detyrosinated neuronal MTs and kinesin motors is essential for development of the neurites (axon and dendrites). The segregated population of tyrosinated and detyrosinated MTs in neuronal axons led to the hypothesis that MT dynamics differ throughout the axon and growth cone. In neurons, it is believed that tyrosinated MTs function in growth cone dynamics and rapid cytoskeletal remodeling since these MTs are dynamic and more easily turned over than detyrosinated MTs. Conversely, detyrosinated MTs (and maybe Δ2-tubulin as well) are believed to function in cargo transport and MT stabilization given their resistance to depolymerization (for review, see ref. 2). In early stages of neuronal growth and development, KIF5 accumulates in the neurite destined to be the axon21 with the enrichment of detyrosinated tubulin serving as a spatial cue for determining neuronal polarity (which neurite will become the axon)22. Disruption of kinesin-MT binding (due to a lack of detyrosinated MTs) might play a major role in neuronal degeneration modeled by the pcd mice that express a mutant CCP1/Nna1 protein23. The pcd mice that carry a mutation in the CCP1 gene have increased levels of tyrosinated alpha-tubulin and manifest adult-onset degeneration of Purkinje and retinal neurons and structurally defective sperm1. Further in vivo functional analyses of the role for tyrosination/detyrosination in neuron development were made possible with TTL-knockout mice that express no detectable tyrosinated MTs in neurons. These mice demonstrate that tubulin tyrosination is essential for normal development, growth, and function of neurons. Animals without tyrosinated tubulin suffer from malformed cerebral cortical layers, disrupted neuronal connections between the cortex and thalamus, and perinatal death24. As would be expected, cortical and hippocampal neurons cultured from these mice exhibit altered neurite outgrowth, premature and abnormal axonal differentiation, and altered binding of +TIP proteins such as CLIP-170. In addition, the growth cones of neurons cultured from knockout mice have an altered morphology that is correlated with changes in F-actin, MT, and myosin localization25. Marcos et al.25 found that Rac1, but not Cdc42, GTPase activity is increased several fold in knockout mice compared to wild-type embryos as measured by western blotting of “pulled-down” active GTPases. The authors25 also found that Rac1 inhibition significantly reverses myosin mislocalization. Neurons are not the only cell type adversely affected by loss of TTL. Fibroblasts cultured from these mice have a less-polarized shape, defective motility, express an overabundance of detyrosinated MTs, mislocalized CLIP-170, and mis-oriented spindle bodies17. This phenotype is partially rescued by overexpression of MCAK, a motor that preferentially depolymerizes tyrosinated MTs but under conditions of overexpression, can depolymerize detyrosinated MTs as well14. This rescue suggests that the alterations are likely due at least in part to altered binding of MAPs such as kinesin motors with MTs that impact neurite development and stability. Besides kinesin motors, binding between +TIPs and MTs was also impaired in the TTL-knockout mice24,25. The clinical impact of tyrosination/detyrosination is still being explored as many studies have reported that TTL is downregulated in animal and human cancers. Indeed, low levels of TTL and correspondingly, tyrosinated tubulin, correlate with increased tumor development and invasiveness3. The tubulin PTM of acetylation was first reported in the early 1980s. Acetylation of the epsilon amino group of lysine at position 40 (Lys40) occurs on alpha-tubulins of assembled MTs including those of cytoplasmic, spindle, centriolar, and axonemal origins (spanning algae to mammals)1-3 (see Fig. 2). The acetylation of Lys40 is only found on alpha tubulins and is considered the primary site of tubulin acetylation. Similar to detyrosination, acetylation is considered a marker of MT age (MTs that are more stable and resistant to turnover). Recently, other lysine residues in alpha-tubulin and beta-tubulin have been reported to be targets for acetylation based on proteomic analyses. Some of these residues are on the outer surface of the MT, as opposed to Lys40, which is in the MT lumen2,26. Acetylated tubulin is considered a marker of stable MTs resistant to nocodazole, although acetylation itself does not cause MT stabilization27. Under depolymerizing conditions (nocodazole or colchicine, but not cold), acetylated MTs are more stable than non-acetylated MTs. When stabilized by taxol, MTs become acetylated, suggesting MT stability occurs independently of acetylation28,29. Acetylation does not affect tubulin polymerization or depolymerization30. The dogma that acetylation is restricted to stable MTs has been revised in recent years and now it is known that tubulin acetylation is also found on dynamic MTs30. Particular cell subpopulations that do not have stable MTs can still undergo MT acetylation. In mature neurons, acetylated MTs are non-uniformly distributed with enrichment in the proximal region of axons and present at decreased levels in the cell body, dendrite, and growth cone. Conversely, in young neurons, acetylated MTs are in the proximal regions of the neurites and cell body undergoing neurite outgrowth7,30,31. Two enzyme complexes suggested to catalyze acetylation of MTs are the N-acetyltransferase ARD1-NAT1 complex32 and the Elongator complex33. MEC-17 has recently been identified as another alpha-tubulin acetyltransferase34. Akella et al.34 argue that currently it is the only protein to have been positively identified as an alpha-tubulin acetyltransferase as these other enzymes have not been shown to have direct interactions with alpha-tubulin. However, Wloga and Gaertig1 argue that the ARD1-NAT1 and Elongator acetyltransferases have been shown to be co-localized with acetylated MTs and can even regulate the level of acetylated Lys40 on alpha-tubulin (for review, see refs 1 and 2). Deacetylation of acetylated tubulin can be accomplished by at least two enzymes. One is histone deacetylase 6 (HDAC6) and the second is SIRT2, the mammalian homolog of silent information regulator 2/sirtuin type 2. Both enzymes deacetylate multiple targets, one of which is tubulin. Both enzymes colocalize with MTs7. HDAC6 associates with MTs and deacetylates alpha-tubulin in vitro on pre-assembled MTs and in cells. HDAC6 does not deacetylate soluble tubulin heterodimers in vitro. SIRT2 can use both soluble and polymerized tubulin as a substrate (for review, see ref 30; see Table 1). 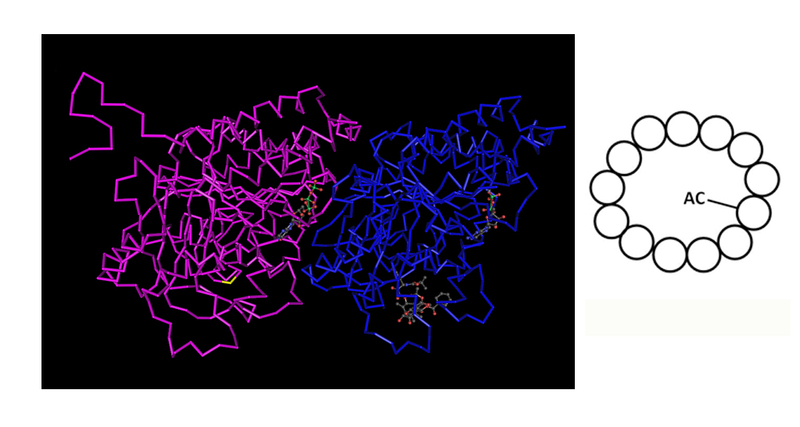 Figure Legend: Left image is tubulin acetylated on Lysine 40 (yellow residue). Right image is schematic showing acetylated tubulin localized in the lumen of microtubule. Acetylated MTs are found in many different types of cells and structures, including flagella of algae, neurons, primary cilia of mammalian cells, and spindle MTs, but the function of acetylation in all of these populations is still very unclear30. Recent studies suggest that tubulin acetylation has multiple functions in cells, including ciliogenesis in mammals as well as a role in neuronal neurite development and MAP binding. In neurons, acetylation by ARD1-NAT1 was shown to be important for dendrite extension and arborization. Likewise, inhibition of the Elongator complex results in impaired neuronal migration and branching1-3,33. Creppe et al.33 showed that overexpression of a non-acetylatable mutant alpha tubulin in cortical neurons impairs migration and branching of neurite projections. Also, the velocity of BDNF-associated vesicles was reduced as they moved along MTs1. Thus, acetylation in neurons could be relevant for migration, differentiation, growth, and synaptic targeting of proteins. Acetylation also influences the transport and binding of MAPs such as the KIF5 kinesin motor to select MTs, specifically those that comprise the neurite destined to be the axon. Recently, Hammond et al.35 showed that an increase in just deacetylated alpha-tubulin did not affect entry of KIF5 into developing axons of differentiating neurons leading to the conclusion that acetylation alone does not direct KIF5 into axons. Instead, the authors35 suggested that multiple PTMs, including acetylation, possibly in combination with inhibition of GSK3b, are involved in KIF5 localization. While the singularity of acetylation’s role in directing MAP localization is questionable, there is no debate that acetylation plays an important role in directing localization of KIF5 and possibly other kinesin motors. Biochemical experiments demonstrated that binding of KIF5 to neuronal MTs only occurs when Lys40 on alpha-tubulin is acetylated36,37. In neurons and fibroblasts, KIF5 preferentially associates with acetylated and detyrosinated MTs7, 16,21,35,38,39. In vitro, KIF5 binding increases in parallel to acetylation levels of Lys40 on alpha-tubulin22,36,40. Paclitaxel stabilization of MTs increases acetylation (and other PTMs) and promotes the accumulation of KIF5 in neurites in a non-preferential pattern35,41. Acetylation can also act as a guidance cue for motor proteins36,42. Inhibition of HDAC6 delocalizes KIF5-cargo complexes in neurons1, reinforcing the notion that KIF5 prefers acetylated MTs for trafficking cargo. Other motors (kinesin-2 [KIF17] and kinesin-3 [KIF1A]) do not show preference for acetylated MTs1. Besides the question of which PTMs are needed for kinesin motor localization, another puzzle is how the acetylated tubulin serves as a guide for kinesin motor activity as Lys40 is toward the MT lumen. How does the acetylated Lys40 residue interact with KIF5? Most interactions, if not all, between MAPs and MTs occur on the outer surface of MTs. Clinically, MT acetylation has been implicated in neurodegenerative diseases such as Huntington’s disease (HD) and Parkinson’s disease (PD)7 as well as screening HDAC6 inhibitors as anti-cancer compounds30. HD is a disease characterized by cognitive and motor deficits involving impaired transport of vesicles containing BDNF that depend on MTs. Reduced BDNF delivery removes trophic support to neurons that can lead to neurodegeneration. Inhibition of deacetylation predictably increases acetylated MT levels which stimulates vesicular delivery of BDNF in cell culture. This improved transport also likely involves kinesin-1 and dynein, both of which were recruited to acetylated MTs during enhanced BDNF transport40. It is important to note that increasing tubulin acetylation enhanced the motility of kinesin-1 in polarized hippocampal neurons, but did not alter the preferential localization of kinesin-1 to the axon of polarized neurons35. Thus, MT acetylation offers a target to treat both cancer and neurodegenerative diseases and could serve as a template for how other PTMs could be similarly exploited in the clinic. Despite the evidence for an essential role for acetylation in MT functions, conflicting data have emerged. In protist models, alpha-tubulin acetylation is not necessary for ciliogenesis1 and ciliated protozoan cells unable to acetylate Lys40 have a normal morphology, display growth patterns, and characteristics indistinguishable from WT cells43,49. These cells have cilia-dependent motile functions that are the same as WT cells43,49. In vitro studies with purified tubulin detect no effects of acetylation on polymerization dynamics11-13 and in vitro MTs that cannot be acetylated can still assemble43,44. Mice with highly acetylated alpha-tubulin (deletion of HDAC6) appear normal except for a subtle increase in bone mineral content and reduced immune responses43,44,50. In culture, increased acetylation through HDAC inhibition leads to MT stabilization based on their resistance to nocodazole depolymerization45 and cell morphology is unaltered44,50. Fibroblasts prepared from HDAC6-null mice have similar characteristics46. Phosphorylation of tubulin was first reported in the early 1970s by multiple research groups51-53. In the past 4 decades, our understanding of the phosphorylation of tubulin, the sites affected, and the physiological relevance remains severely limited. While most tubulin PTMs act on tubulin subunits already incorporated into MTs, phosphorylation can act on both tubulin heterodimers and polymers. One of the tubulin residues targeted for phosphorylation is Serine172 (Ser172). In the case of Ser172, phosphorylation only occurs on beta-tubulin54 (see Fig. 3). Besides phosphoserine 172, other serine as well as tyrosine residues on tubulin alpha/beta heterodimers (and MTs) are presumed targets of phosphorylation55-61. Tubulin is phosphorylated by a variety of kinases. For example, alpha and beta tubulin are phosphorylated in vitro by the prostate-derived sterile 20-like kinase, a modification antagonized by taxol59. Non-receptor tyrosine kinases such as pp60c-src, Fes, Jak2, and Syk also phosphorylate a tyrosine residue(s) on tubulin56,57,60-62. Syk specifically targets a tyrosine residue in the C-terminal tail (CTT) of alpha-tubulin under in vivo and in vitro conditions57,62. In vitro, beta-tubulin can also be modified by phosphorylation at the Ser172 residue by the Cdk1/cyclin B complex when tubulin is in heterodimeric form. Cdk1/cyclin B does not phosphorylate alpha-tubulin54. Other kinases that phosphorylate tubulin include insulin receptor kinase55. Despite the many kinases shown to phosphorylate tubulin in vitro, their activity in vivo and the modification sites involved are unknown1,63. The kinases that phosphorylate tubulin are not known to be exclusive for this cytoskeletal protein. Phosphatases that specifically reverse phosphorylation of tubulin have not been reported to the best of our knowledge (see Table 1). Figure Legend: Phosphorylated tubulin (yellow residue). The physiological relevance of tubulin phosphorylation remains an active area of research with studies suggesting a role for phosphorylation in regulating polymerization, both positively and negatively. An early functional study found that phosphorylation of beta-tubulin is increased by serum deprivation-induced cell differentiation. The level of phosphorylation is also influenced by the state of MT polymerization as taxol stimulates phosphorylation while nocodazole decreases it64. Although this study64 did not report which residues were phosphorylated, more recent studies have focused on tyrosine and serine residues. Laurent et al.60 found that the non-receptor tyrosine kinase Fes not only phosphorylates tubulin, but also promotes tubulin polymerization. However, the exact role phosphorylation might have in the Fes-mediated enhancement of polymerization is unclear since the stoichiometric phosphorylation of tubulin was not required for increased MT assembly60. Alternatively, phosphorylation of alpha-tubulin on tyrosine residues can prevent the incorporation of this tubulin into MTs65 and impair polymerization in vitro55. Similarly, Cdk1/cyclin B-mediated phosphorylation at Ser172 on beta-tubulin impaired the incorporation of these modified subunits into polymers54. Analysis of the 3-D structure of tubulin revealed that phosphoserine 172 is near the nucleotide binding area and the introduction of a negatively charged phosphate group could reduce GTP/GDP binding and turnover. Such interference would impair polymerization. Because tubulin phosphoserine 172 was detected in mitotic cells, the authors54 speculate that the Cdk1-mediated phosphorylation might regulate MT dynamics during mitosis. Vogel et al.58 has also reported that phosphorylation of tubulin (gamma subunit, Tyr445 residue) plays a role in regulating mitosis, likely by controlling MT assembly and number. Within the last two decades, researchers have reported that another tubulin PTM is ubiquitination and recent research efforts are focused on examining how ubiquitination affects tubulin polymerization and function. Tubulin heterodimers that comprise the MTs of various subpopulations (mitotic spindle, neuronal projections, centrioles/basal bodies, and axenomes) are the target of various ubiquitin ligases (see Fig. 4). Several ubiquitin ligases target tubulin, including the E3 ubiquitin ligase parkin66,67, ubiquitin C-terminal hydrolase L168,69 (UCH L1), and the breast and ovarian cancer susceptibility protein 1 (BRCA1) ubiquitin ligase70. The exclusivity of ubiquitin ligases for tubulin remains to be determined, as does which deubiquitinating enzymes target tubulin and their specificity for ubiquitinated tubulin. For review of ubiquitination and its regulation of cytoskeletal dynamics, see the review by Schaefer et al.71 and references within (see Table 1). Figure Legend: Mono- or poly-ubiquitinated tubulin (yellow circles). The physiological relevance of tubulin ubiquitination remains under investigation, but it is known that gamma-tubulin is ubiquitinated by the ubiquitin ligase BRCA1, a modification required for tubulin nucleation and normal centrosome function70,72,73. Ubiquitination has also been implicated in α/β-tubulin turnover and ubiquitination of α/β-tubulin has been observed in various cellular processes66,74-76. UCH L1 is a multi-functional protein with ubiquitin ligase activity in vitro68. Recently, UCH L1 was identified as a tubulin-interacting protein by mass spectrometry, and a UCH L1 mutation associated with Parkinson’s disease as well as carbonyl-modified UCH L1 promotes tubulin polymerization77. Bheda et al.69 reported that UCH L1 is involved in regulation of microtubule dynamics in vitro and in vivo. Moreover, UCH L1 was found to associate with mitotic spindles, suggestive of a role in mitosis. Thus, recent data suggest that ubiquitination of tubulin inhibits microtubule formation and possibly function69,71 . Polyglutamylation and polyglycylation are the addition of one or more glutamate or glycine residues, respectively78,79, to a/b tubulin heterodimers. These modifications, known as polymodifications, were discovered in the early 1990s and are often discussed together as the same glutamate residues are the substrate for these PTMs (see Fig. 5). The MTs that comprise the mitotic spindle, neuronal projections, centrioles/basal bodies, and axenomes undergo polyglutamylation. Conversely, polyglycylation occurs mainly on MTs of the axoneme. The axoneme is the cytoskeletal structure that comprises flagella and cilia. Cilia and flagella are evolutionarily conserved MT-based organelles protruding from the cell surface that perform dynein-driven beating for cell locomotion or flow generation. They also play important roles as cellular antennae, allowing cells to respond to external stimuli. Flagella are also found on cells with a primary role in human reproduction80-82. Recently, abnormal formation or function of cilia has been linked to a broad range of human genetic disorders termed ciliopathies80. Given the prominent roles that tubulin glutamylation and glycylation play in cilia function (see below), these polymodifications may be involved in a myriad of human diseases. Despite targeting the same glutamate residues, these polymodifications have unique attributes. While both tubulin subunits undergo both polymodifications, the extent of the modification is spatially regulated. For example, in superior cervical ganglion neurons, tubulin glutamylation is abundant on beta-tubulin in somatodendritic regions, while alpha-tubulin is glutamylated to a greater extent in axons83. Furthermore, glutamylation of alpha-tubulin is abundant in young neurons whereas glutamylation of beta-tubulin increases during post-natal development84. In vivo, the length of the polymodification side chains correlates with the type of MT. For example, in ciliates, the side chains are longer in axonemes compared to MTs in the cell body1,85,86. Also, in vivo competition between the polymodifications is reported, likely due to the fact that both modifications occur on the same substrate: glutamate residues in the CTT81,82. This has led researchers to speculate that the two polymodifications negatively regulate each other. Until recently, one of the mysteries associated with tubulin polymodifications has been the identity of the glutamylation and glycylation enzymes. 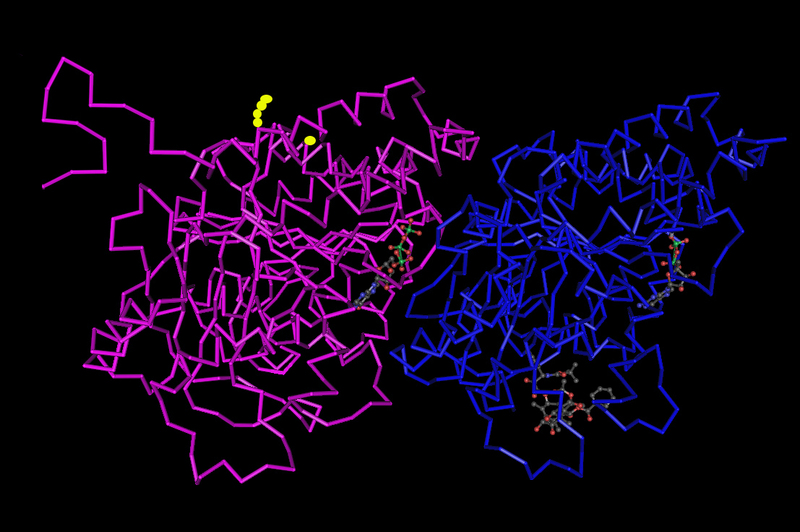 These enzymes are now known to be members of the tubulin tyrosine ligase-like (TTLL) family of proteins81,82,86-88. The polymodifications involve initiation and elongation processes and the TTLL proteins exhibit a preference for the tubulin isoforms (alpha vs beta)87. Both polymodifications form a variable number of peptide side chains that attach to the g-carboxyl groups of glutamate residues in the CTTs of a/b tubulin86,88,89. Specific TTLL proteins are involved with the initiation vs elongation steps of polymodification. TTLL proteins 1, 4, 5, and 7 initiate addition of glutamate residues, while elongation is mediated by TTLL proteins 6, 9, 11, and 1387,90. TTLL3 and TTLL8 initiate addition of glycine residues while TTLL10 mediates elongation in mammals89. In neuronal MTs, TTLL proteins 4 and 7 target beta-tubulin whereas TTLL proteins 5, 6, 11, and 13 exhibit a preference for alpha-tubulin7. Identification of the deglutamylases and deglycylases is a very active research field. Carboxypeptidases (CCPs) have recently been demonstrated to function as deglutamylases with CCP1, 4, 5, and 6 removing glutamate residues in mammalian cells10,91 and CCPP-6 (nematode cytosolic CCP protein) doing the same on the MTs of nematode cilia91. O’Hagan et al.92 further expanded these findings, reporting that CCPP-1 also deglutamylates the MTs of nematode cilia. Finally, Lalle et al.93 identified two metallopeptidases, gDIP1 and gDIP2, that function as deglycylases in vitro and in vivo. (see Table 1). Figure Legend: Glutamylated or glycylated tubulin (yellow circles). Both polymodifications occur on the CTT which is where structural and motor MAPs bind89, suggesting that these PTMs could regulate such binding to confer MT functional diversity1-3. Indeed, recent in vitro studies demonstrate that tubulin polyglutamylation can modulate the binding of structural and motor MAPs to MTs, which could serve as a means of controlling the functional specificity of MT subpopulations90,94-96. Additional insights into the potential functions of polyglutamylation and polyglycylation have recently come to light. Polyglutamylation of tubulin has been shown to be context specific within the same cell97 with glutamylation associated with stabilization of cell body MTs and destabilization of axonemal MTs. Polyglutamylation has also been reported to promote MT severing in vivo and in vitro, suggesting that this PTM could act as a signal to control MT mass and stability98. Polyglutamylation could also affect neuron development as local MT severing is required for neurite outgrowth98 and most neuronal MTs are highly polyglutamylated2,78. Polyglutamylation has also been implicated in neurodegenerative disorders with Rogowski et al.10 clearly demonstrating that tubulin hyperglutamylation is responsible for the degeneration of Purkinje cells in pcd mice. While an exact role for glutamylation and glycylation in ciliary or flagellar function is unknown, it is clear that these modifications are critical for normal ciliary function. Polyglutamylation of axonemal MTs of airway epithelial cilia is required for normal ciliary function involving dynein activity99,100. Likewise, polyglycylation is required for assembly and functioning of cilia and flagellar axonemes81. Indeed, RNAi knockdown of the TTLL3 glycylase in Drosophila testes caused abnormal sperm tail axonemes which correlated with decreased male viability and sterility82. Despite these recent gains in understanding tubulin polymodifications, much remains to be discovered, including the identity of all the tubulin deglutamylases and deglycylases10,91-93. Multiple techniques can be utilized to examine expression of the PTMs discussed above, including western blotting, mass spectrometry, immunoprecipitation, ELISA, immunohistochemistry (IHC), immunocytochemistry (ICC), and radiolabeling. Below is some additional information on the antibodies and other reagents used for studying PTMs. Listed below are some of the antibodies made against Δ2-tubulin, glutamylated tubulin, tyrosinated tubulin (YL1/2), alpha tubulin (Clone alpha 3a), polyglutamylated tubulin, and phosphorylated tubulin. This includes Cytoskeleton's anti-alpha/beta tubulin antibody (Cat. # ATN02) and PTMtrue antibodies against phosphotyrosine (Cat. # APY03), acetyl lysine (Cat. # AAC01), ubiquitin (Cat. # AUB01), and SUMO-2/3 (Cat. # ASM23) PTMs. Reagent Tools from Cytoskeleton, Inc.
To provide researchers with the tools to study tubulin PTMs, Cytoskeleton offers purified tubulin proteins, PTM antibodies, and activation assays. Cytoskeleton has purified mammalian brain tubulins as well as tubulin from HeLa and MCF-7 cancer cell lines. These purified tubulins can be incubated with modifiers such as kinases, ubiquitin ligases, tyrosine ligases, glutamylases, glycylases, and HDAC6, as well as the enzymes that reverse PTMs. Cytoskeleton also offers a pan-anti-tubulin antibody that detects various isoforms of tubulin from multiple species and labels tubulin independent of PTMs (Cat. # ATN02). This antibody would be useful as a capture protein for many isoforms of tubulin and that which has been modified. Then a second antibody can be used to more closely examine a particular PTM or isoform. To examine a particular PTM, Cytoskeleton Inc. offers PTMtrue antibodies against phosphotyrosine (Cat. # APY03), acetyl lysine (Cat. # AAC01), ubiquitin (Cat. # AUB01), and SUMO-2/3 (Cat. # ASM23) PTMs. To read a white paper comparing the APY03 phosphotyrosine antibody with other phosphotyrosine antibodies, please click here. For the SUMO-2/3 antibody white paper, please click here. To study changes in polymerization of tubulin, we offer polymerization assay kits (Cat. # BK004P, BK006P, BK011P) with different types of tubulin based on the levels of MAPs present. Cellular functions of tubulin PTMs are just now beginning to be understood. Much remains to be determined, especially since MTs can undergo multiple PTMs. Current research demonstrates that PTMs affect two MT-based properties. First, PTMs appear to regulate the stability and/or structure of MT assemblies. This regulation might be by directly affecting MT structure or indirectly by regulating the binding of one or more MAPs. Second, PTMs affect recruitment of MAPs to MTs. The PTMs could specify or direct molecular cargoes to specific subcellular regions (e.g., dendrites vs axons of neurons). PTMs could also serve as a marker of stable MTs that are preferred for trafficking and intracellular transport. In this way, PTMs could be identifiers of functionally specialized MTs. As noted, the specific contribution of a PTM is complicated by the observation that PTMs of tubulin are not mutually exclusive. Different PTMs modulate different molecular events and cross-talk between PTMs could further refine or affect such events. For example, the binding of the KIF5 motor protein is regulated by multiple PTMs, including acetylation, detyrosination, and polyglutamylation. All three PTMs might be necessary for the specialized localization of KIF5. Also, MTs originating from neurites are detyrosinated and acetylated while MTs at the distal end of neurites (near growth cone) are tyrosinated and not acetylated. This difference has functional importance as MTs at the growth cone need to be dynamic and easily modified while MTs in the proximal region of neurites need to be stabilized. Thus, PTM cross-talk is an area of research that will continue to merit serious research efforts. 1. Wloga D. and Gaertig J. (2010). J. Cell Sci. 123, 3447-3455. 2. Janke C. and Kneussel M. (2010). Trends Neurosci. 33, 362-372. 3. Hammond J., Cai D., and Verhey K.J. (2008). Curr. Opin. Cell Biol. 20, 71-76. 4. Barra H.S., Arce C.A., Rodriguez J.A., and Caputto R. (1974). Biochem. Biophys. Res. Commun. 60, 1384-1390. 5. Khawaja S., Gundersen G.G., and Bulinksi J.C. (1988). J. Cell Biol. 106, 141-149. 6. Paturle- Lafanechère L., Manier M., Trigault N., Pirollet F., Mazarguil H., et al. (1994). J. Cell Sci. 107, 1529-1543. 7. Fukushima N., Furuta D., Hidaka Y., Moriyama R., and Tsujiuchi T. (2009). J. Neurochem. 109, 683-693. 8. Kalinina E., Biswas R., Berezniuk I., Hermoso A., Aviles F.X., et al. (2007). FASEB J. 21, 836-850. 9. Rodriguez de la Vega M., Sevilla R.G., Hermoso A., Lorenzo J., Tanco S., et al. (2007). FASEB J. 21, 851-865. 10. Rogowski K., Dijk J.v., Magiera M.M., Bosc C., Deloulme J.-C., et al. (2010). Cell. 143, 564-578. 11. Maruta W.T., Greer K., and Rosenbaum J.L. (1986). J. Cell Biol. 103, 571-579. 12. Paturle L., Wehland J., Margolis R.L., and Job D. (1989). Biochemistry. 28, 2698-2704. 13. Webster D.R., Wehland J., Weber K., and Borisy G.G. (1990). J. Cell Biol. 111, 113-122. 14. Peris L., Wagenbach M., Lafanechère L., Brocard J., Moore A.T., et al. (2009). J. Cell Biol. 185, 1159-1166. 15. Liao G. and Gundersen G.G. (1998). J. Biol. Chem. 273, 9797-9803. 16. Dunn S., Morrison E.E., Liverpool T.B., Molina-Paris C., Cross R.A., et al. (2008). J. Cell Sci. 121, 1085-1095. 17. Peris L., Thery M., Faure J., Saoudi Y., Lafanechère L., et al. (2006). J. Cell Biol. 174, 839-849. 18. Bieling, P., Kandels-Lewis S., Telley I.A., van Dijk J., Janke C., et al. (2008). J. Cell Biol. 183, 1223-1233. 19. Kumar N. and Flavin M. (1982). Eur. J. Biochem. 128, 215-222. 20. Chapin S.J. and Bulinski J.C. (1994). Cell Motil. Cytoskeleton. 27, 133-149. 21. Jacobson C., Schnapp B., and Banker G.A. (2006). Neuron. 49, 797-804. 22. Konishi Y. and Setou M. (2009). Nat. Neurosci. 12, 559-567. 23. Fernandez-Gonzalez A., La Spada A.R., Treadaway J., Higdon J.C., Harris B.S., et al. (2002). Science. 295, 1904-1906. 24. Erck C., Peris L., Andrieux A., Meissirel C., Gruber A.D., et al. (2005). Proc. Natl. Acad. Sci. U.S.A. 102, 7853-7858. 25. Marcos S., Moreau J., Backer S., Job D., Andrieux A., et al. (2009). PLoS ONE. 4, e5405. 26. Choudhary C., Kumar C., Gnad F., Nielsen M.L., Rehman M., et al. (2009). Science. 325, 834-840. 27. Palazzo A., Ackerman B., and Gundersen G.G. (2003). Nature. 421, 230. 28. Piperno G., LeDizet M., and Chang X.J. (1987). J. Cell Biol. 104, 289-302. 29. Wilson P.J. and Forer A. (1997). Cell. Motil. Cytoskeleton. 37, 20-32. 30. Perdiz D., Mackeh R., Pous C., and Baillet A. (2011). Cell. Signal. 23, 763-771. 31. Witte H., Neukirchen D., and Bradke F. (2008). J. Cell Biol. 180, 619-632. 32. Ohkawa N., Sugisaki S., Tokunaga E., Fujitani K., Hayasaka T. et al. (2008). Genes Cells. 13, 1171-1183. 33. Creppe C., Malinouskaya L., Volvert M.L., Gillard M., Close P. et al. (2009). Cell. 136, 551-564. 34. Akella A.J., Wloga D., Kim J., Starostina N.G., Lyons-Abbot S., et al. (2010). Nature. 467, 218-222. 35. Hammond J.W., Huang C.-F., Kaech S., Jacobson C., Banker G., et al. (2010). Mol. Biol. Cell. 21, 572-583. 36. Reed N.A., Cai D., Blasius T.L., Jih G.T., Meyhofer E., et al. (2006). Curr. Biol. 16, 2166-2172. 37. Bulinski J.C. (2007). Curr. Biol. 17, R18-20. 38. Nakata T. and Hirokawa N. (2003). J. Cell Biol. 162, 1045-1055. 39. Cai D., McEwen D.P., Martens J.R., Meyhofer E., and Verhey K.J. (2009). PLoS Biol. 7, e1000216. 40. Dompierre J.P., Godin J.D., Charrin B.C., Cordelieres F.P., King S.J., et al. (2007). J. Neurosci. 27, 3571-3583. 41. Witte H. and Bradke F. (2008). Curr. Opin. Neurobiol. 18, 479-487. 42. Setou M., Seog D.H., Tanaka Y., Kanai Y., Takei Y., et al. (2002). Nature. 417, 83-87. 43. Gaertig J., Cruz M.A., Bowen J., Gu L., Pennock D.G., and Gorovsky M.A. (1995). J. Cell Biol. 129, 1301-1310. 44. Zhang Y., Kwon S., Yamaguchi T., Cubizolles F., Rousseaux S., et al. (2008). Mol. Cell. Biol. 28, 1688-1701. 45. Matsuyama A., Shimazu T., Sumida Y., Saito A., Yoshimatsu Y., et al. (2002). EMBO J. 21, 6820-6831. 46. Tran A.D., Marmo T.P., Salam A.A., Che S., Finkelstein E. et al. (2007). J. Cell Sci. 120, 1469-1479. 47. Haggarty S.J., Koeller K.M., Wong J.C., Grozinger C.M. and Schreiber S.L. (2003). Proc. Natl. Acad. Sci. USA. 100, 4389-4394. 48. Zilberman Y., Ballestrem C., Carramusa L., Mazitschek R., Khochbin S. et al. (2009). J. Cell Sci. 122, 3531-3541. 49. Kozminski K.G., Diener D.R., and Rosenbaum J.L. (1993). Cell Motil. Cytoskeleton. 25, 158-170. 50. Zhang Y., Li N., Caron C., Matthias G., Hess D., Khochbin S., and Matthias P. (2003). EMBO J. 22, 1168-1179. 51. Goodman D.P.B., Rasmussen H., DiBella F., and Guthrow C.E. Jr. (1970). Proc. Natl. Acad. Sci. U.S.A. 67, 652-659. 52. Murray A.W. and Froscio M. (1971). Biochem. Biophys. Res. Commun. 44, 1089-1095. 53. Eipper B.A. (1972). Proc. Natl. Acad. Sci. U.S.A. 69, 2283-2287. 54. Fourest-Lieuvin A., Peris L., Gache V., Garcia-Saez I., Juillan-Binard C., et al. (2006). Mol. Biol. Cell. 17, 1041-1050. 55. Wandosell F., Serrano L., and Avila J. (1987). J. Biol. Chem. 262, 8268-8273. 56. Matten W.T., Aubry M., West J., and Maness P.F. (1990). J. Cell Biol. 111, 1959-1970. 57. Faruki S., Geahlen R.L., and Asai D.J. (2000). J. Cell Sci. 113, 2557-2565. 58. Vogel J., Drapkin B., Oomen J., Beach D., Bloom K., et al. (2001). Dev. Cell. 1, 621–631. 59. Mitsopoulos C., Zihni C., Garg R., Ridley A.J., and Morris J.D.H. (2003). J. Biol. Chem. 278, 18085-18091. 60. Laurent C.E., Delfino F.J., Chen H.Y., and Smithgall T.E. (2004). Mol. Cell. Biol. 24, 9351-9358. 61. Ma X. and Sayeski P.P. (2007). Biochemistry. 46, 7153-7162. 62. Peters J.D., Furlong M.T., Asai D.J., Harrison M.L., and Geahlen R.L. (1996). J. Biol. Chem. 271, 4755-4762. 63. Verhey K.J. and Gaertig J. (2007). Cell Cycle. 6, 2152-2160. 64. Gard D.L. and Kirschner M.W. (1985). J. Cell Biol. 100, 764-774. 65. Ley S.C., Verbi W., Pappin D.J.C., Druker B., Davies A.A., et al. (1994). Eur. J. Immunol. 24, 99-106. 66. Ren Y., Zhao J., and Feng J. (2003). J. Neurosci. 23, 3316-3324. 67. Xu G., Paige J.S., and Jaffrey S.R. (2010). Nat. Biotechnol. 28, 868-873. 68. Liu Y., Fallon L., Lashuel H.A., Liu Z., and Lansbury P.T. Jr. (2002). Cell. 111, 209-218. 69. Bheda A., Gullapalli A., Caplow M., Pagano J.S., and Shakelford J. (2010). Cell Cycle. 9, 980-994. 70. Starita L.M., Machida Y., Sankaran S., Elias J.E., Griffin K. et al. (2004). Mol. Cell. Biol. 24, 8457-8466. 71. Schaefer A., Nethe M., and Hordijk P.L. (2012). Biochem. J. 442, 13-25. 72. Sankaran S., Crone D.E., Palazzo R.E., and Parvin J.D. (2007). Cancer Biol. Ther. 6, 1853-1857. 73. Parvin J.D. and Sankaran S. (2006). Cell Cycle. 5, 1946-1950. 74. Huang K., Diener D.R., and Rosenbaum J.L. (2009). J. Cell Biol. 186, 601-613. 75. Thompson W.E., Ramalho-Santos J., and Sutovsky P. (2003). Biol. Reprod. 69, 254-260. 76. Iqbal K, Grundke-Iqbal I. (1991). Mol. Neurobiol. 5, 399-410. 77. Kabuta T., Setsuie R., Mitsui T., Kinugawa A., Sakurai M. et al. (2008). Hum. Mol. Genet. 17, 1482-1496. 78. Edde B., Rossier J., Le Caer J.-P., Desbruyeres E., Gros F., et al. (1990). Science. 247, 83-85. 79. Redeker V., Levilliers N., Schmitter J.-M., Le Caer J.-P., Rossier J., et al. (1994). Science. 266, 1688-1691. 80. Waters A.M. and Beales P.L. (2011). Pediatr. Nephrol. 26, 1039-1056. 81. Wloga D., Webster D., Rogowski K., Bre M.H., Levilliers N., et al. (2009). Dev. Cell. 16, 867-876. 82. Rogowski K., Juge F., van Dijk J., Wloga D., Strub J.-M., et al. (2009). Cell. 137, 1076-1087. 83. Ikegami K., Mukai M., Tsuchida J., Heier R.L., Macgregor G.R., et al. (2006). J. Biol. Chem. 281, 30707-30716. 84. Audebert S., Koulakoff A., Berwald-Netter Y., Gros F., Denoulet P., et al. (1994). J. Cell Sci. 107, 2313-2322. 85. Iftode F., Clerot J.C., Levilliers N. and Bre M.H. (2000). Biol. Cell. 92, 615-628. 86. Wloga D., Rogowski K., Sharma N., Dijk J.V. Janke C. et al. (2008). Eukaryotic Cell. 7, 1362-1372. 87. Janke C., Rogowski K., Wloga D., Regnard C., Kajava A.V., et al. (2005). Science. 308, 1758-1762. 88. van Dijk J., Rogowski K., Miro B., Lacroix B., Eddie B., et al. (2007). Mol. Cell. 26, 437-448. 89. Nogales E. (2000). Annu. Rev. Biochem. 69, 277-302. 90. Boucher D., Larcher J.C., Gros F., and Denoulet P. (1994). Biochemistry. 33, 12471-12477. 91. Kimura Y., Kurabe N., Ikegami K., Tsutsumi K., Konishi Y., et al. (2010). J. Biol. Chem. 285, 22936-22941. 92. O’Hagan R., Piasecki B.P., Silva M., Phirke P., Nguyen K.C., et al. (2011). Curr. Biol. 21, 1685-1694. 93. Lalle M., Camerini S., Cecchetti S., Fantauzzi C.B., Crescenzi M., et al. (2011). J. Biol. Chem. 286, 4471-4484. 94. Bonnet C., Boucher D., Lazereg S., Pedrotti B., Islam K., et al. (2001). J. Biol. Chem. 276, 12839-12848. 95. Larcher J.C., Boucher D., Lazereg S., Gros F., and Denoulet P. (1996). J. Biol. Chem. 271, 22117-22124. 96. Ikegami K., Heier R.L., Taruishi M., Takagi H., Mukai M., et al. (2007). Proc. Natl. Acad. Sci. U.S.A. 104, 3213-3218. 97. Wloga D., Dave D., Meagley J., Rogowski K., Jerka-Dziadosz M., et al. (2010). Eukaryotic Cell. 9, 184-193. 98. Lacroix B., Dijk J.v., Gold N.D., Guizetti J., Aldrian-Herrada G., et al. (2010). J. Cell Biol. 189, 945-954. 99. Ikegami K., Sato S., Nakamura K., Ostrowski L.E., and Setou M. (2010). Proc. Natl. Acad. Sci. U.S.A. 107, 10490-10495. 100. Suryavanshi S., Edde B., Fox L.A., Guerrero S., Hard R., et al. (2010). Curr. Biol. 20, 435-440. 101. North B.J., Marshall B.L., Borra M.T., Denu J.M., and Verdin E. (2003). Mol. Cell. 11, 437-444. 102. Hubbert C., Guardiola A., Shao R., Kawaguchi Y., Ito A. et al. (2002). Nature. 417, 455-458. 103. Ersfeld K., Wehland J., Plessmann U., Dodemont H., Gerke V., et al. (1993). J. Cell Biol. 120, 725-732.